Podcast: The Adventure Zone: Live In Atlanta! 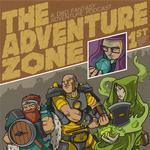 Podcast: The Adventure Zone: The Announcement Zone: Season Two, MaxFunDrive and more! Podcast: The Adventure Zone: Candlenights in Tacoma! Podcast: The Adventure Zone: Live in San Diego! Podcast: The Adventure Zone: Live in Austin! Everyone's favorite talk show about a podcast hosted by the participants in said podcast is back! This time, we're talking about the end of the Balance campaign, answering a bunch of listener questions and talking about what's next for the show!